Major injuries from hiking are rare. Walking doesn't tend to break bones or kill people. But, there are a whole bunch of smaller injuries and ailments that can make your day miserable. Being ready for the majority of them will make your trips more enjoyable and may help someone else that was not prepared. Stay Alive - yourself, others, and the victim. Especially yourself. If you are unable to help, then no one gets out alive. Stabilize Injury - stop the injury from doing further damage to the victim. Stop bleeding, remove them from the cause. Start Recovery - make the victim better. Fix the injury or ailment as much as possible. You always have to keep yourself safe. Then, you need to ensure the survival of everyone else. This means getting the group to warmer shelter if one person is becoming hypothermic rather than having everyone stop to help that one person. This means running out of the way of a rockslide rather than jumping into it to save someone falling. If someone is injured or sick, you need to check that every action you are taking follows one of the three guidelines. If it does not, then it is probably not a necessary action. It is so much easier to provide first aid by preventing the need for it in the first place. Easily the biggest hazard for hikers is the environment - changes in weather or ill-prepared hikers get into the most trouble. Make sure everyone in your group has the necessary abilities to successfully complete the planned hike. Make sure they have proper clothing, plenty of water, and extra food. 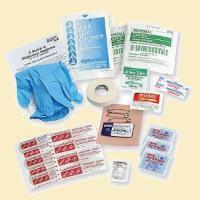 Everyone should have a small personal first aid kit and there should be one more complete kit for the group. There are pages discussing specific preparation for hiking at altitude, hiking in heat, and hiking in cold that you should read. Before you go hiking in a new area, find out about poisonous plants, snakes, insects, dangerous animals, and other possible hazards. You can easily buy a ready-made first aid kit and there are some very good ones available through the links over on the right. You may be able to save space by making your own, or by replacing some parts of a purchased kit. It is important that you know the purpose of and how to use every item in your kit - otherwise it's just extra weight. You won't have much time to read a manual while administering to an injury. 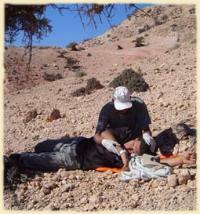 Taking wilderness first aid training should be a personal goal before heading into the wilds. "Medicine for the Backcountry" by B. Tilton has a good reputation for providing helpful first aid information. If you are going into the backcountry, its a good idea to have a small first aid pocket guide along. There are quite a few available, most with help on diagnosing and treating ills and injuries. Wilderness Medical Institute in Colorado offers classes around the country but there are other organizations too. Inspect your kit before every outing and make sure the gear is clean and supplies are in good condition. Replace expired medications and add items that would have been helpful on your last trip. Be sure the kit is easily accessible and everyone in the group knows who has it. Waterproof container - a strong zip-loc bag or plastic-lined kit bag. If it isn't waterproof, it will be a mess. I've gone back and forth about how much of a 1st Aid kit to carry for myself, ranging from a few bandaids to stuff I'm unlikely to need or know how to use. I recommend you pack your own kit--more likely to remember what's in there--and carry it on several longer trips; then, replenish what you've used, add what you needed but didn't have, remove what you haven't used(unless you're carrying a kit for a group--can't comment on that). After many years and increasing experience, I always carry an extensive blister preventive/treatment kit, Neosporin, tweezers/needles, ace bandage, and a variety of OTC painkillers. I removed the remainder of the unused stuff. Every few years I also try to take a refresher hands-on wilderness 1st aid course through Wilderness Medicine Institute; haven't needed it yet, hope I never do. I couldn't find any links to first aid kits that were mentioned in the article as being "to the right", only images of first aid supplies.